1. Combine all ingredients in a blender. Secure with lid and blend until smooth, about 15 to 30 seconds. Refrigerate any remaining smoothie up to 24 hours. 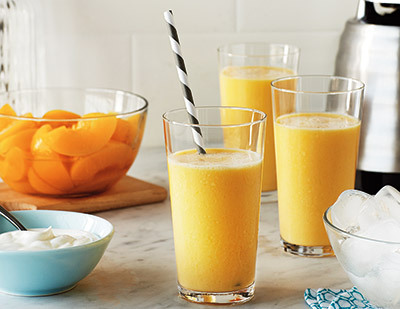 -Peach Banana Smoothie - Blend peaches with 1 banana and ice. -Peach Raspberry Smoothie - Blend peaches with 1/2 cup fresh or frozen raspberries and ice. -Sweet Carrot Peach Smoothie - Blend peaches with 1/2 cup Del Monte Sliced Carrots and ice. -Peanut Butter Boost Peach Smoothie - Blend peaches with yogurt, 2 Tbsp. creamy peanut butter and ice.